Like in many other European countries, the arrival of summer is celebrated on St. John’s Eve in Poland. 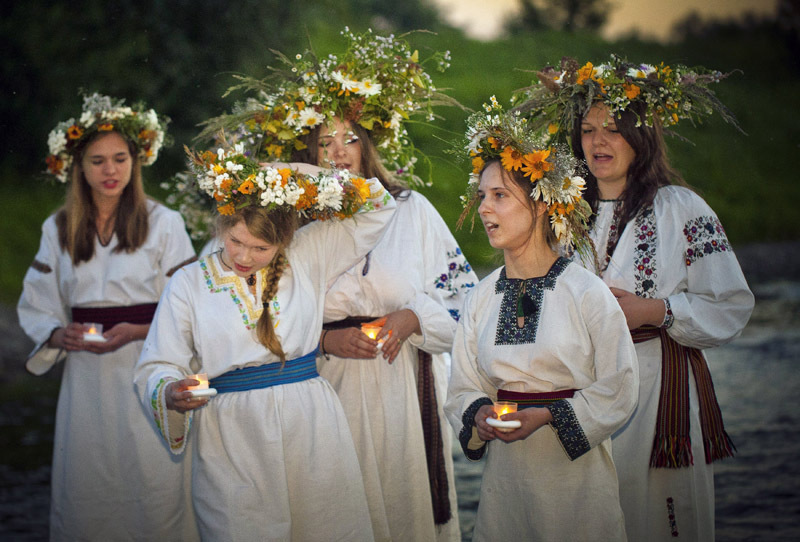 While part of the Polish custom ‒ bonfires, singing and dancing ‒ resembles other celebrations all over the world, the traditional wild flower crowns and fortune-telling rituals date back to Slavic paganism. Ancient Greeks and Romans as well as the Germanic and Slavic tribes of Europe all held celebrations for the summer solstice in one form or another. According to some historians, the Slavic ancestors of modern-day Poles ‒ who eventually formed the first Polish state in the 10th century CE ‒ observed midsummer by having joyful outdoor celebrations with bonfires, dancing and singing, a holiday called Kupala Night. The festivities would often involve some otherwise unthinkable promiscuity, the results of which were justified nine months later by saying that storks had delivered a new brood of babies to the village. (Fittingly, storks return to Europe from Africa about 9 months after the summer solstice.) 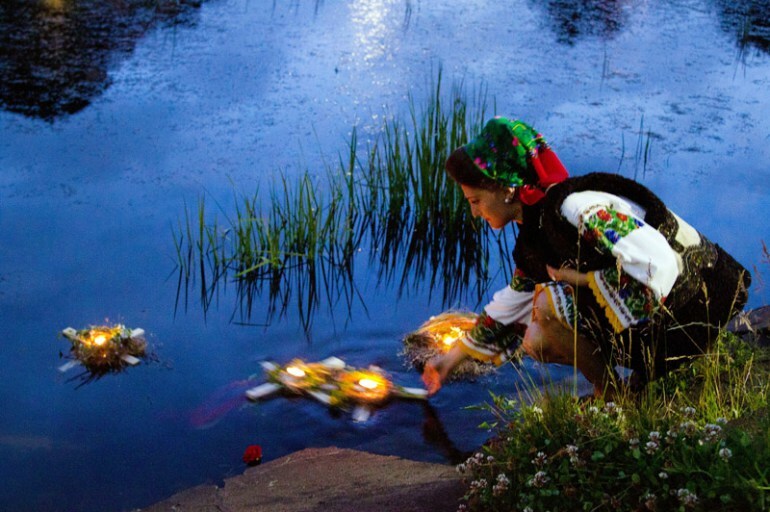 After the founding of the Polish state and the simultaneous introduction of Christianity to its territory in 966, the pagan celebrations of Kupala Night fell into disfavour. Nevertheless, efforts to root out the tradition proved futile. Eventually a tamer version of the custom was incorporated into the Christian calendar as St. John’s Eve. As a result, the conventional Polish celebrations of midsummer are an interesting mix of pagan and Christian influences. Much more than Valentine’s Day, which is widely held to be a dubious cultural borrowing, Kupala Night symbolises love in Poland. Bonfires are thought to be beneficial to lovers, and daring celebrants jump over the flames to secure good fortune and ward off evil. Mullein leaves and wormwood are burnt to keep malicious spirits at bay. Young women make crowns from herbs and wild flowers and, having put a burning candle on top, let them float away on lakes and rivers. It is believed that the fate of the crown predicts the future of its maker. If it floats steadily, or even better, if it is removed from the water by a sweetheart, she will be lucky in love. A sinking or still wreath foretells of unrewarding Tinder trysts and loneliness. If it gets stuck to another wreath a friendship will be formed. Going for a swim outdoors is also customary on St. John’s Eve, if one wishes luck in marriage and motherhood. Some Poles also venture into the woods in search of the mythical fern flower, which appears exclusively in midsummer and can supposedly be found only by people of exceptional virtue. The flower is meant to bring great wealth, but unfortunately botanists do not believe in its existence. In the old days, the hunt for fern flowers was a socially acceptable pretext for unmarried pairs to go on a walk without a chaperone. Some ethnologists tie the fern flower myth to the old belief that adder’s tongue, a plant rarely encountered in Poland, is a powerful aphrodisiac. Lore has it that a woman could make herself more attractive to men by rubbing her skin with the leaves. However, the special properties of the plant could only be activated if a woman incanted ‘so help me God’ during the ritual, a clear example of the entanglement of pagan and Christian traditions in Polish folklore. To mark the Christian character of St. John’s Eve, churches would also sanctify lemon thyme and other medicinal herbs. Most of the traditions mentioned above used to be rural for the most part, but over time they migrated to Polish cities. Nowadays, midsummer is still very much an occasion for merrymaking. Concerts and firework displays are organised by local authorities while the old traditions endure.